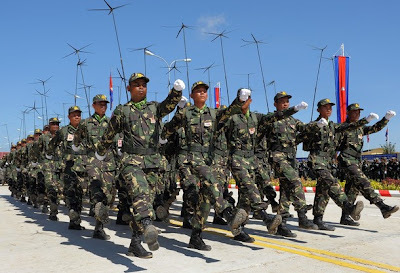 China Defense Blog: Cambodia's Chinese Weapon on Parade. 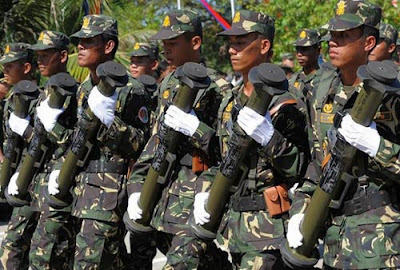 Cambodia's Chinese Weapon on Parade. 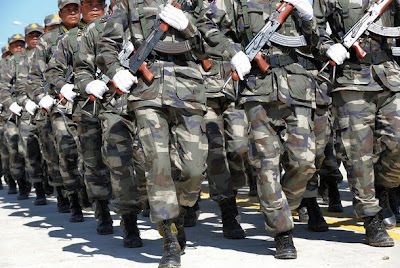 Soldiers of the 70th Royal Cambodian Brigade celebrated the 15th anniversary of its establishment with a parade attended by Prime Minister Hun Sen. 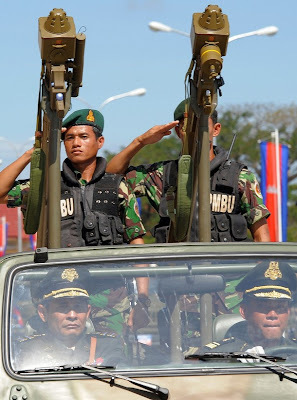 The parade also provided a glimpse into the Royal Cambodian Army's inventory of Chinese weapons. 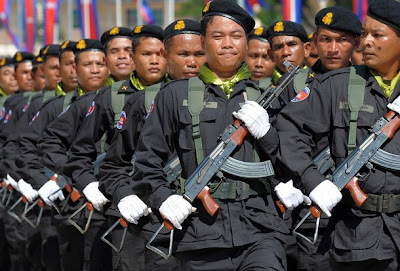 Since 1997, China has became the biggest source of military aid to Cambodia, contributing more than 5 million U.S. dollars a year. A large sum by the Cambodian standard. China also facilitated the construction of the High Command HQ on National Highway 4, commissioned a Combined Arms Officer School in Kampong Speu province and other military projects. China also sponsors 40 Cambodian officers to study in China on a yearly basis. As always, there is "no strings attached" with all those Chinese military aid. 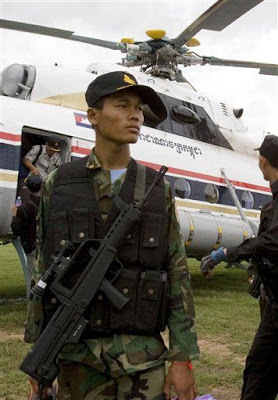 As a side note, in 2007 Royal Cambodian Army became the first confirmed foreign user of the QBZ-95 rifle. lol. so they got fake kalashnikows for own forest and natural reserves.. The original Type 054 pair heads out. ZSL93/WZ523 6x6 Armored Personnel Carrier. A very Chinese way to address Global Warming. The 5th J-10 "Line Regiment"
PLA’ first joint combat night exercise. China and Afghanistan, a debate. More Photos Of The Wuhan Varyag Mockup. Why won't Madeleine return my call?! Y-7 AEW&C Development is "on the Radar Screen"
KJ-2000 AWAC's Radar, An Inside Look.